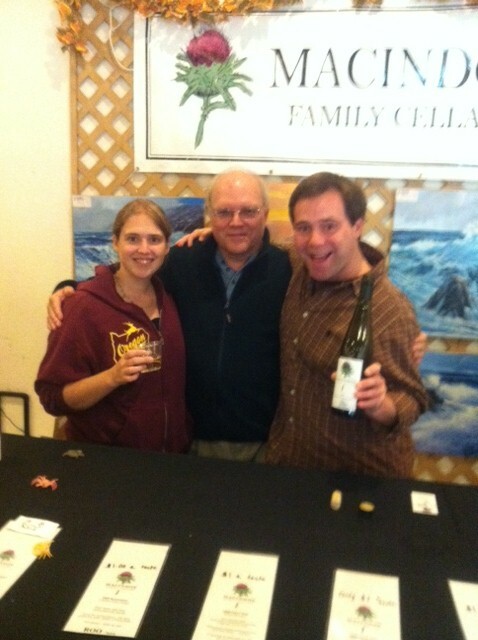 On Saturday, the first day of Gold Beach, Oregon’s Wine, Art & Music Festival, Scott sold Macindoe Family Cellars’ very last bottle of publicly available 2008 Melon de Bourgogne wine. Boy, were we excited!! Pop champagne!! Clink, clink, clink, fizz, fizz! Overflowing… ♪mayyy olllld acquaintance ♫ beeeee forgot…. La la la la la laaaaaah♪♫! ….But, I gotta be honest with you… the sale was also a tad bittersweet for us. The ‘08 Melon was MFC’s first vintage, and Scott’s favorite wine to pair with Dungeness crab. Putting that last bottle with its crisp white linen label and lavender thistle logo into a bag felt just like sending a beloved child off to the first day of kindergarten – we were proud of our little Melon, proud to see it mature – Why, of course, it was only natural for it to leave us eventually. Sniffle. But we were oh so sad to see it leaving the nest. Have a good time, little Melon! Hmm…Although, really, now that I’m thinking about it, there are some pretty notable differences between these two scenarios. I suppose, in general, one doesn’t consume children and I suppose they come back after the first day of kindergarten, and I guess they are also sentient beings, which could be considered a big diff to some observers. Buuuut, regardless… it was sad to see that bottle of ‘08 leave the door! Of course, we will continue to keep several cases of our 2008 Melon in our Wine Library available to Wine Club members, but for public sale, this marks the end of an era for Macindoe Family Cellars. Luckily MFC’s 2009 Melon is in bottles now, so we won’t be skipping a beat at the dinner table! Congratulations, Scott, on this milestone! We don’t have Dungeness crab here in the southeast, but we are sure aplenty in butter! And … the 2008 MFC Melon was, hands down, the choice drink to cut our fatty palates on. So,I say ~ Congratulations on 2008 and, with a sigh of relief, bring on the bottles of 2009!! Thanks, Scott, for making life more delicious!